This hostel is like a boutique hotel. Every little detail has been chosen with great care. 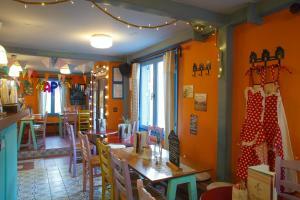 The sole aim at Little Big House is to insure the comfort and enjoyment of your stay. You will love the colorful but quiet neighborhood, high quality beds and the delicious breakfast buffet. 5-Stars!! I highly recommend you book early on their very user friendly website as they are quite popular. Thank you Vicky and company for your excellent hospitality. Vicky and staff gave a warm welcome to Thessaloniki and Ano Poli. It was a pleasure to stay. 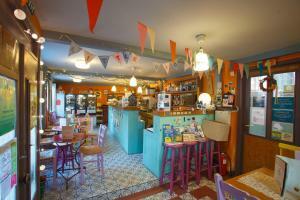 I like everypart of this place, its cozy, its clean, its fun and it has a wonderful staff which they love what they do. Wonderful hostesses and great vibe pervades this place. The beds were well designed with a night lamp stand at bedside with plug points close by, for mobiles. Lockers and electronic key tab for entry were nice. Free coffee and tea, are welcome. So was the small kitchen in room. We didn't get to try the breakfast buffet as we had an early morning flight to catch. The people made me feel at home before we even got there. Great email contact. The place is even better looking than in the pictures. The place is in the old town, so great walks and full of atmosphere. The hostel itself feels as if it is a part of this old town. Breakfast was up on the 'rooftop' terrace. Really chill. Exceptional. Quiet and safe location. Easy to meet other travelers. Very clean, good beds, and above all very nice staff! Location, Breakfast, Room, cleaness and absolutely amazing staff!! Great hostel, best patio/outdoor space and the neighborhood is so unique. Lock in a great price for Little Big House – rated 9.2 by recent guests! 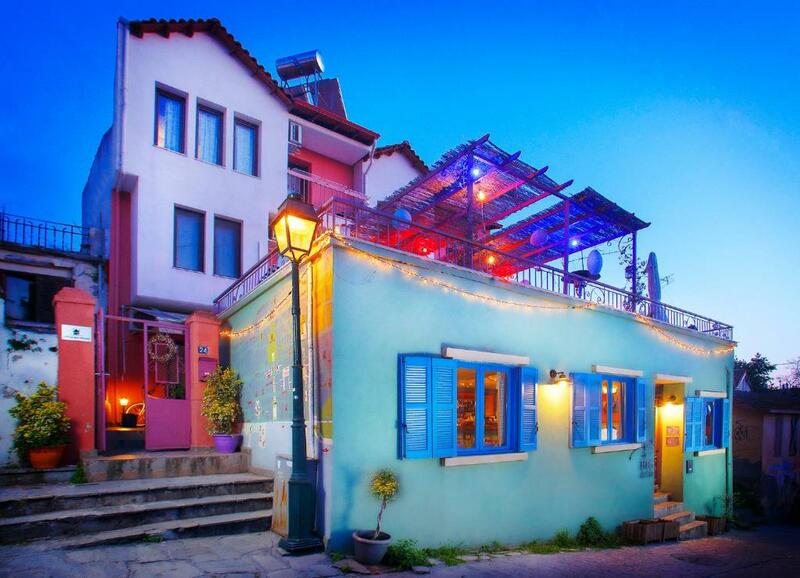 Located in the historical old town of Thessaloniki, Little Big House offers tasteful accommodations just a short walking distance from the city center. 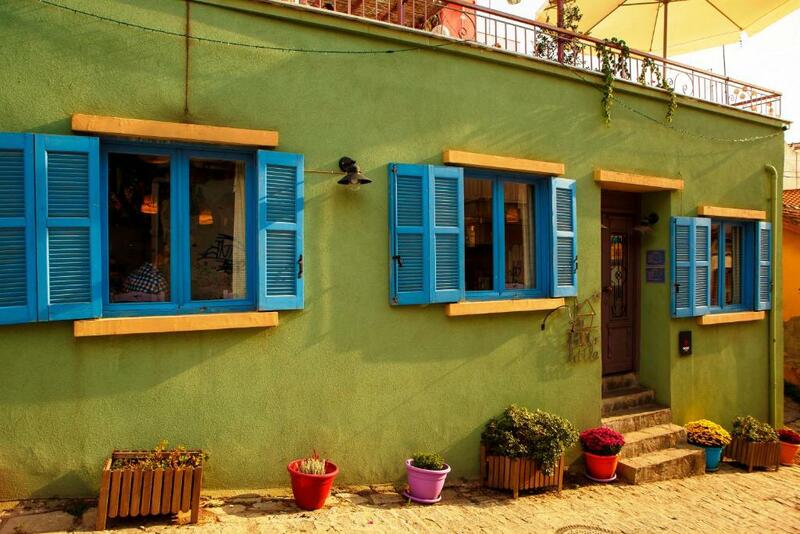 It has a charming, furnished courtyard and serves traditional Greek breakfast in buffet style. 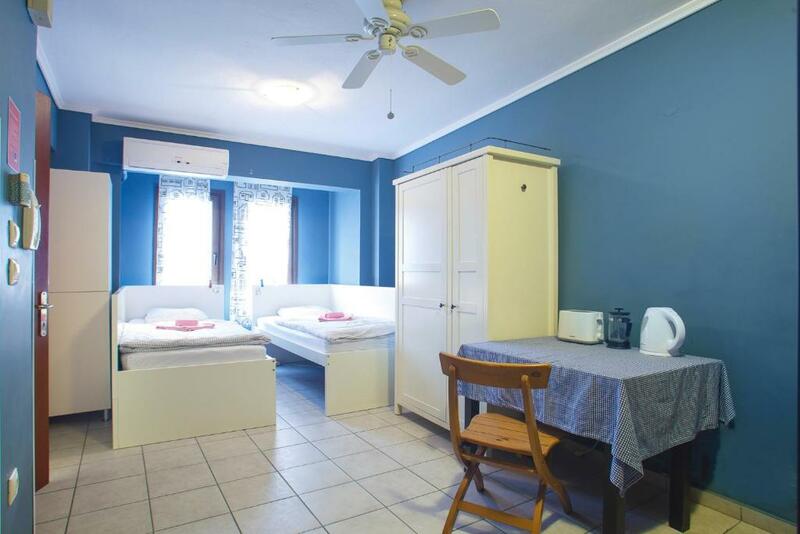 Apartments and dormitories at Little Big House are simply decorated with colorful accents. They include a kitchenette with electric kettle and mini fridge, air conditioning and safety box. All units open out to a balcony with views of the city or the Byzantine Walls. Tsimiski Street, the main commercial street of the city, is a 15-minute walk away from the property. Thessaloniki International Airport is 11 mi away. Free Wi-Fi is provided throughout and free parking is available nearby. When would you like to stay at Little Big House? Enjoying views of the sea and the city from its balcony, this air-conditioned apartment includes a kitchenette with mini fridge and electric kettle and a private bathroom. Offering panoramic city views from its balcony, this air-conditioned dormitory includes a kitchenette with mini fridge and electric kettle and an private bathroom. Please note that this room cannot accommodate a child or extra bed or baby cot. Located on the ground floor with direct access to the garden, this air-conditioned apartment offers a kitchenette with a fridge, dining area and breakfast utilities. This double room features a kitchenette, dining area and seating area. This bed in dormitory has a dining area, stovetop and oven. This bed in dormitory features a kitchenware, air conditioning and kitchenette. Our guesthouse, Little Big House, was created in 2011, in Thessaloniki, as a result of our desire to provide travellers with a cozy and quiet place, where they can feel like home, while enjoying all the privileges of being hosted in a modern, clean and friendly environment. Little Big House is a brother & sister (Harris & Vicky) both project and dream that came true in the summer of 2011, since we always wanted to honor and return all great hospitality that we had experienced after travelling around beautiful places in the world. Moreover, it seemed like the perfect way to express our love for our city, providing a place from which one can indulge to Thessaloniki’s beauties. The travellers that we welcome everyday are for us the living proof that people have the ability to change the world. We strogly believe that all people, no matter where they are from, have a lot of things to share. And when they find themselves in a sphere with understanding, tolerance, love and solidarity they create magic! We invite you to start your journey from the ideal location in Thessaloniki, providing you a friendly, relaxing, hospitable and affordable accommodation. Currently, Little Big House Guesthouse & Cafe, is the working and creative home of eight amazing girls : Anastasia, speaking Spanish, English and Greek fluently, is a vigorous bar tender that serves warm smiles along with delicious drinks & snacks. Christina, speaking Russian, Greek, English and a little bit of Turkish, is a loveable and talented musician that manages to dance her way through amazing bar tending. Lina & Katerina, speaking Russian and Greek fluently, are the beautiful super powers that create miracles when it comes to keeping the cleaning standards high. Sophia, speaking English and Greek fluently, apart from diligently and joyfully checking guests in, she is mastering in providing the best insights in any cultural, artistic and worthwhile event in the city. Maria, speaking Italian, English and Greek fluently, is the cornerstone of the Reception, full of professionalism, politeness and always there for the guests' requests. Athina, speaking Spanish, English and Greek fluently, is the beating heart of Little Big House' Reception. Knowledgable, sociable and passionate about everything in the city and especially about all delicious food options. Vicky is the house mum! Location being of key importance, we decided to renovate our house that was set in the most beautiful and historical area of the city, the Old City area (in Greek “Ano Poli”). Our location is ideal for travelers who want their trips to be relaxing and free from transport means. Everything one should and would want to experience in Thessaloniki is in a short and pleasant walking distance. Moreover, Ano Poli, as a location, offers visitors the privillege of both being placed in a very picturesque and quiet area and being just 10 -15 minutes walking distance from everything in the modern, busy city centre. Built in the uphill part of the city, Ano Poli offers the most amazing panoramic views, but also exciting and adventurous walks through its small alleys that give a visitor the opportunity to time travel, while enjoying really authentic food and drink options. House Rules Little Big House takes special requests – add in the next step! Little Big House accepts these cards and reserves the right to temporarily hold an amount prior to arrival. The property reception operates everyday from 08:00 am to 00:00 pm. If you arrive early for check-in, you are welcome to leave your luggage with us and relax in the common areas. Breakfast is available from 8:30-11:00 am. Cash, credit/debit card are all accepted as payment methods upon arrival (apart from American Express). Guests of all ages are welcome. Guests under the age of 18 years old may stay only in a private room or, in a dormitory if it is booked completely. This property does not have a elevator; therefore guests might have to climb some stairs in order to reach the rooms. Unless you book a private room, there is no guarantee that you and your group will stay in same room. Please note that the property reserves the right to pre-authorize the card used for booking. - they are on a leash in public areas. Please inform Little Big House of your expected arrival time in advance. You can use the Special Requests box when booking, or contact the property directly using the contact details in your confirmation. Wifi was a bit slow... but I struggle to come up with anything else! Staff is amazingly kind and friendly, easy check-in with a welcome coffee (the frappe is awesome!) and we even had it earlier than scheduled. Room and hallway was cleaned more or less everyday. Lastly: the outside terrace is obviously the Place to Be! Location is not down by the water, but I think that's really good (plus best taverna in town is just down the street). The vanity cupboard is too close to the sink, making it difficult to wash face/rinse mouth when brushing teeth. Amazingly pleasant staff. Beautiful, arty funky decor, intricately designed dorms with kitchen! Great place to meet people and the location is perfect. I was sad to leave. I didn't "not like" anything really- however I will say that the shared rooms could be improved. My suggestion would be a little curtain of some sort so there is at least a small element of privacy, especially for solo travelers in larger shared rooms. Something to note is that if you're coming to Thessaloniki by bus, it's quite far from the train/bus station. Keep this in mind. Everything. The staff where so so friendly and helpful. I love the vibe of the place and the outdoor terrace. It's in a great location in the old city. I got a welcome drink on arrival which was lovely. The shower is a tad small and didn't get hot for me, but I could care less because the rest was so amazing! The absolute best hostel I have ever seen and stayed in. The decor is amazing, the cafe is so awesome and has really good food available, also always free coffee and tea. The breakfast is included and really good, and a towel and locker were also included, which is unheard of. The room was huge, it was like a mini two-bedroom apartment, it had its own kitchen and small dining area. 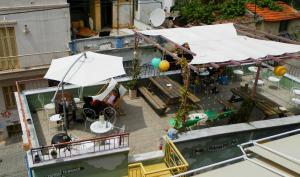 The place also has a rooftop and backyard patio. Overall an incredible use of the space. The location is also really great, its in the cute old town which is quiet and safe and charming, and you can actually find a parking spot for your car. The city is within walking distance so you get the best of everything. The staff are some of the kindest people I have ever met, they gave really good city recommendations, really top quality service. Beds are really comfortable and cozy. Good wifi too! I really cannot say enough good things about this place. I would come back to Thessaloniki just to stay at this hostel. The people who stay here are all really nice, the overall vibe is relaxed and happy. What makes all of this even more amazing is that it is so affordable, and everything comes included with the price. Kitchen inside the room is very bad idea when your roommate starts to bake sausages. Helpful staff and very good breakfast. The staff are brilliant especially Vicky and Kika. The cafe food is really good, I like the fact it was homemade. I would recommend the soup and Vicky’s bread basket. Host was great. Location was great. Breakfast was great. I think wardrobes are not very feasible if you have several types of clothes. I think they should be a bit bigger and racks should be provided. Secondly, sometimes, even though it is sunny, the water stream is not warm enough. It was almost perfect. Breakfast is good enough compared to the price. Employees are always so helpful and positive. Also, concept of the hostel is quite welcoming. Products which they offer in the hostel are delicious. It is very close to both parts of the city. Great atmosphere. Very friendly and helpful staff. This was our second stay here and we enjoyed both visits a lot. In the corridor of the building where i stayed some strange smell was, like oil evaporation. In bathroom the ventilator that extracts air filled with dust and I'am allergic to dust Room 4. Nice cozy hostel with lovely smiled hosts. Near hostel there is Alysseos Tower which gives you the perfect view of the city. Room warm, clean bathroom, WIFI great. Coffee and Tea free during the stay. Near hostel there two restaurants and one small bakery. Breakfast was fine. I like the spirit there.. The warmth the peace the love the kindness the care.. Super clean.. Staff were more than helpful.. Scrumptious Frapé! Amazing breakfast.. Colorful decorations..